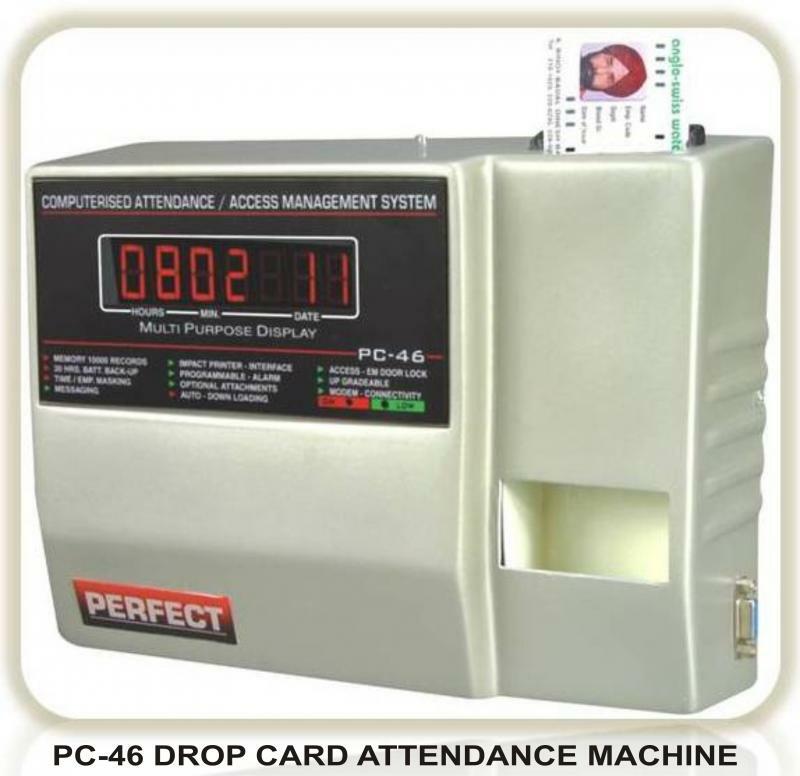 PERFECT INDUSTRIAL INSTRUMENT - Computerised Attendance System For Present & Futuristic Time Office Needs: The computerized attendance recording system involves a simple recognition of credit card sized attendance card in the machine. The card number is thus scanned and gets stored in the stand-alone data capture and storage unit (i.e., the time recorder clock) against that corresponding date and time. Those data can be transferred in the computer to which it is connected through software at any time and several attendance plus leave reports can be generated. Our time recorder clock comes with several features like in built battery back-up, siren facility, detailed message facility, employee and time masking, on-line and off-line communication and auto downloading of data, RS 232 as well as RJ45 communication, etc.The computerized attendance recording system consist of two software: 1. Data capture software: The software which controls the time recorder clock and takes care of the data stored in it. 2. Report generation software: This software generates various time office reports depending on the data received from the time recorder clock. Common Features : RTCMillennium quartz crystal RTC with 10 years battery back-upMemoryLarge data storage memory for 10,000 recordsLCD/LED Display16 char. JUMBO dual line BACKLIT LCD OR 7 Seg. LED Display (both options are available)Messaging /callTo draw attention of an employee while recognition card for urgent needs. Eg, explanation for a) Absenteeism/late arrival/needed by a senior management person/require to do overtime, etc.b) Message for birthday/anniversaries/promotion, etc.Auto DownloadingIt downloads data automatically from time recorder to PC as per pre-determined duration - 1minute and onwardsTime MaskingSystem controlled upto 40 nos. 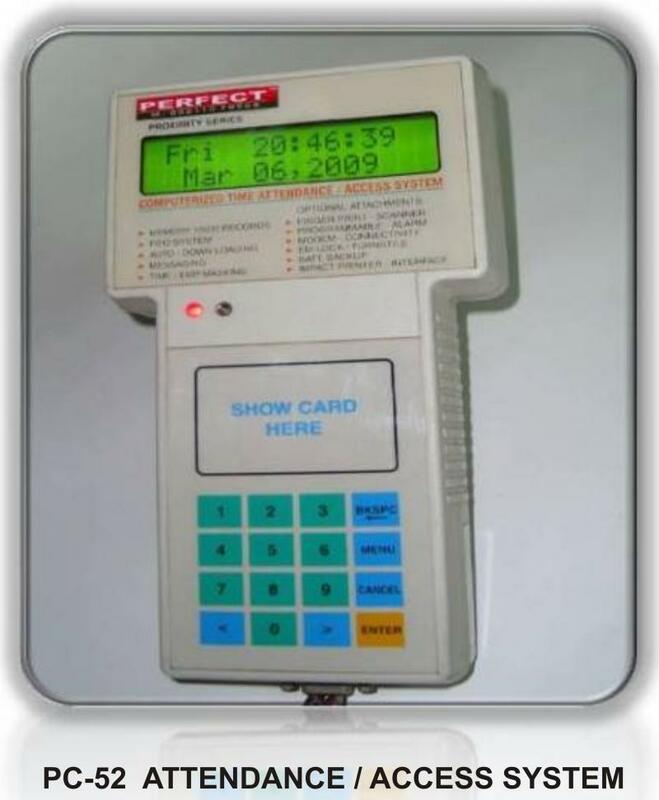 of shifts(Wrong shift employee not allowed at the machine level)Employee MaskingSuspended/terminated employees' cards not recognized at the machine level upto 200 employees.Employee Name Display16 character name display upto 50 employeesPassword Protection2 levels of password control data transfer utility.Dual communication* RS-232 upto 500 metres* RS-485 for more than 500 meters and upto 2KM.On-line displayMemory status of each machine at the computer level as well as machine levelSoftwareTIME OFFICE, PAYROLL, multilevel & multicompany reportsLED IndicationsPower on, battery low, memory low/full Additional Features : MULTIPLE CONNECTIONSUpto 128 machines Can be connected (32 per set and step down converter thereafter)MODEM CONNECTIVITYAuto download of data through telephone line from different locations with multiple machine (auto redial, line disconnection incase of idle mode) ACCESS CONTROLElectro-magnetic door lock & door monitoring sensor.a) Only authorized people's entry allowed in restricted area.b) Turnstile gate to allow only one person at a time and to check unauthorized entry.ALARM/SIRENProgrammable 24 alarm settings daily/weekly and each alarm is of adjustable duration 0-99 seconds. The computerized attendance recording system involves a simple recognition of credit card sized attendance card in the machine. The card number is thus scanned and gets stored in the stand-alone data capture and storage unit (i.e., the time recorder clock) against that corresponding date and time. Those data can be transferred in the computer to which it is connected through software at any time and several attendance plus leave reports can be generated. Our time recorder clock comes with several features like in built battery back-up, siren facility, detailed message facility, employee and time masking, on-line and off-line communication and auto downloading of data, RS 232 as well as RJ45 communication, etc. 1. Data capture software: The software which controls the time recorder clock and takes care of the data stored in it. 2. Report generation software: This software generates various time office reports depending on the data received from the time recorder clock. a) Absenteeism/late arrival/needed by a senior management person/require to do overtime, etc. b) Message for birthday/anniversaries/promotion, etc. Suspended/terminated employees' cards not recognized at the machine level upto 200 employees. 2 levels of password control data transfer utility. * RS-485 for more than 500 meters and upto 2KM. Electro-magnetic door lock & door monitoring sensor. a) Only authorized people's entry allowed in restricted area. b) Turnstile gate to allow only one person at a time and to check unauthorized entry. Programmable 24 alarm settings daily/weekly and each alarm is of adjustable duration 0-99 seconds.